Our "Red/Black Challenge" winner is Clouds85! 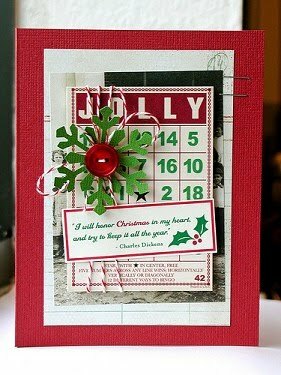 Love her classic layout using the exclusive dotted paper from our November Kit just a touch of red and pink . . . one of my favorite color combinations! And here's a great card using red, black, and greeen . . . perfect for this time of year! Love the subtle bit of Group Photo peeking out from behind the Christmas Bingo Card. Clouds85 . . . email me at doris.sander@gmail.com and i'll tell you about your prize! We still have one more challenge open this year and it's an easy one! "Thanksgiving Photos Challenge" ends next Sunday, December 19th. Click HERE for more information.